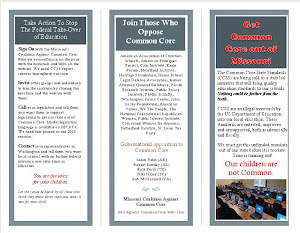 Missouri Education Watchdog: Teenager Designs "Stop Common Core" T-Shirt and Speaks Out Against Common Core. Meet Natalie. 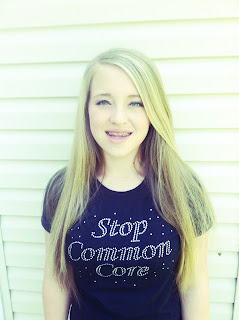 Teenager Designs "Stop Common Core" T-Shirt and Speaks Out Against Common Core. Meet Natalie. Teenager designs "Stop Common Core" t-shirts. You can order one. This teenager is against Common Core. She has done her own research and come to the conclusion the takeover of public education by private organizations is not based on best educational practice. She informs audiences, teachers, principals, and students that the adoption/implementation of CCSS circumvented the legislative process. She has discovered her entrepreneurial streak, is proclaiming her opposition to CCSS and is inviting folks to ask her questions about Common Core. Our children are watching. That is what I tell myself when this fight against Common Core becomes a heavy burden to bear. Our children are watching how we choose to take a stand for the freedom that our Constitution endows us with from the minute we are born as Americans. They watch and learn from us, what their schools and Common Core will never teach them. They learn that the process by which Common Core was adopted was unconstitutional. They learn that “we the people” are supposed to always have a voice that is not only heard, but revered. They are learning how our system is supposed to work, as we protest this injustice under the first amendment to our Constitution. They are learning many lessons as we choose to fight a battle right here in this country for the freedoms that our brave soldiers are defending right now with their lives overseas. They are learning that it is their responsibility to defend those rights that our Constitution has represented to a free Republic for many generations, and not allow those rights to be redefined by a few who do not share our vision of what it means to truly be free. They are learning how to defend their birthright, and what it means to be an American by watching us take a bold stand. One child, in particular, has touched my heart as a mom. Her name is Natalie Sales. I have watched her sit and intently listen as I have shared the truth about what Common Core really is all about to the moms in my circle of friends. I have watched her attend meetings where the facts about the adoption/implementation of Common Core are revealed in speeches by Mary Byrne (not the Department of Elementary/Secondary Education), and seen her take notes so she can do research on her own when she gets home. I have heard the stories other kids share about how she boldly questions her teachers on why they believe Common Core is the right option for children, and then asks for the ability to present the other side of the issue to the class when that teacher tries to endorse what they do not understand. I was told that she took her message to a small, rural school in our area where several teachers and a principal met in a library to hear what this 13 year old girl had to say about what the Common Core was about and how it came to be. The teachers were enlightened, and angry once they learned the truth. She encouraged them all to go home and watch Jane Robbins' videos on Common Core and continue to seek out the truth on the issue, and to not be complacent. She urged them to find their voices on behalf of children just like her. She has started the conversation among her peers, and challenges them to KNOW the truth as well. Natalie has boldly taken her message to the moms and dads at the local sports club, and to the staff at the pizza place her family visits frequently. She is talking to anyone who will listen to her about the perils of Common Core, and how it was adopted without the knowledge or consent of the governed as it should have been. She sees Common Core as a true threat to the sovereignty of her country and she is compelled to act even though she is only 13 years old. She has also designed T-Shirts (see below) that she proudly wears to school and around town that advertises her intent to Stop Common Core. She wears them with the hope someone will ask what her shirt means. She loves to tell them why. She makes me smile. Keep fighting. Our children are watching. There is hope for our future because they are learning from us how to exercise those rights they are never taught about in school. They are learning how to fight and protect freedom as we know it. There is hope for the future when I see kids like Natalie Sales take the lessons she is learning from her parents and other adults as they stand for the children of this great nation in an effort to defend our future. Although our children may never be taught anything about our Constitution or Bill of Rights in their public schools any more, know that they are learning those lessons in living color by watching us exercise our rights granted by those documents as we choose to not back down in our fight for what is right. Natalie Sales is evidence of this fact. She is a young patriot who is making a difference, and learning because the adults in her life are not willing to be silent about the injustice of Common Core. She exemplifies the fact that our children are watching and learning. May the lessons they learn from this fight we fight leave an imprint on their hearts that teach them what it means to protect their birthright to live free, and cherish what it means to be an American. Natalie will be speaking next on Monday,July 29 from 5-7 PM in Council Bluffs, Iowa at the public library, Meeting Room B. If a teenager has the courage to speak out against Common Core, adults should certainly do the same. What kind of educational system are we leaving to our children and grandchildren? That is a great way to get the word out!! 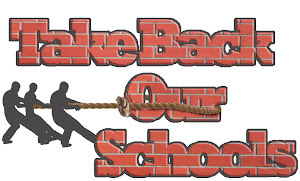 Your classmates need to know what is happening to them in their education. Possibly inform their parents who may have no idea what is going on! College Readiness for How Many?